The result of written examination had released on 10th April 2015 on the official website of RRB. The RRB has also released the schedule of original document verification to check originality of candidate which is going to be conducted on 11th March 2015. They are required to report at the office of Railway Recruitment Board, Malda at 10.30 hrs. on the dates mentioned against Roll Numbers provided in the list released by RRB. They should bring two passport size photographs (as pasted on the Application Form) along with original documents and their copies, in two sets, attested by gazetted officer in support of their possessing specified Educational Qualification, Proof of Age and Caste certificate (in prescribed format) etc. which is mentioned below. RRB has released waiting list of candidates called for verification of certificates and genuineness of candidature ( AS WAIT LISTED CANDIDATES ). Those 30% additional candidates are being called as wait listed over and above the no. of vacancies primarily to avoid shortfall in the panel due to absenteeism of the selected candidates etc., if any. It should be noted by the candidates of the following Roll Nos. that merely calling for the verification of documents and genuineness of candidature does not in any way, entitle them for an Employment / Appointment in Railways. RRB had released result of Bhuvaneshwar Exam 2015 for written examination of Section Engineer on 23rd March 2015 against category number 1,3,5,8,10, 21,22,24, 25 & 32 on official website in which 58 candidates have provisionally selected for these posts and called for original document verification which is scheduled on 15th April 2015 at Railway Recruitment Board, Bhubaneswar Office. 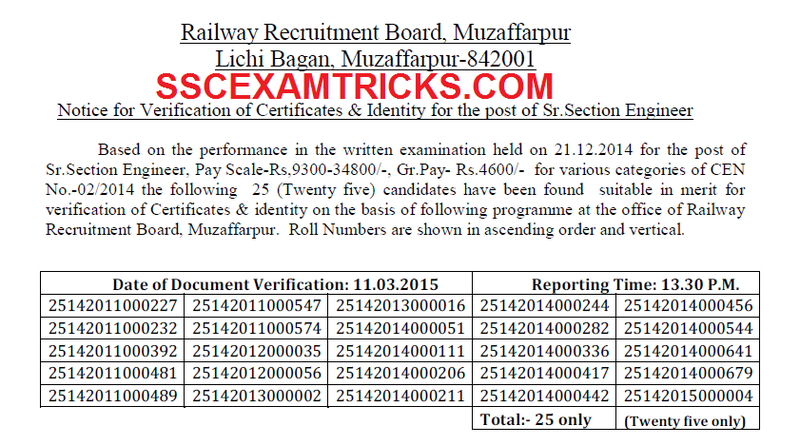 Railway Recruitment Board (RRB) has released written test result / Merit List/ Marks Details of written examination which was successfully conducted written examination for the post of Senior Section Engineer (SSE) for various Engineering Branches on 21st December 2014 at various centres in all over the country. The short listed candidates are required to attend document verification which will be conducted on various dates by respective RRB Zone in which candidates had applied for these posts. The call letters to these shortlisted candidates will be sent by Registered/Speed post. No candidates will be allowed to attend this document verification schedule with call letters. Late coming candidates will also be not allowed to attend document verification which will be conducted by RRB selection committee duty officers. 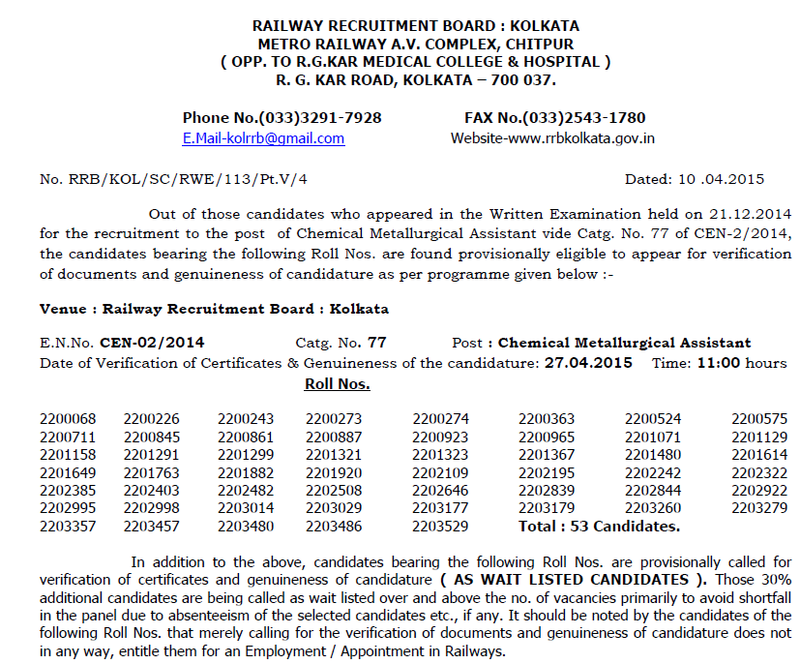 Earlier RRB had released notification on 20th September 2014 advertisement no. 02/2014 for the posts of Senior Section Engineer Group (Senior Section Engineer, Chief Depot Material Superintendent) Grade Pay Rs.4600 for the various engineering graduate candidates in various disciplines/ trades/ branches. The last date to apply online application for these posts was 19th October 2015. Lakhs of candidates had applied for these posts. A huge no. of candidates had appeared in the written exam. Those candidates who had appeared in the written examination can download their result / document verification schedule from the direct link provided in the end of the posts. The Final Selection of the candidates will be based on the performance in single stage written examination followed by the verification of the documents. No further interview is needed to be conducted for selection of suitable candidate. The qualified candidates must qualify a Medical fitness test conducted by Railway Administration and final verification of original documents and community certificate along with verification of character of individual candidates. 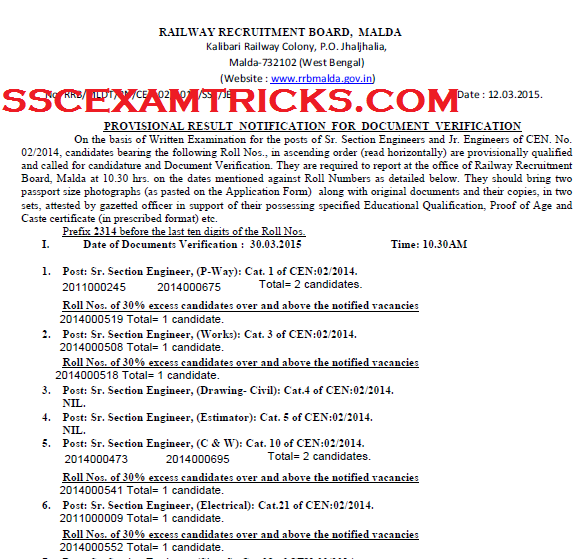 RRB SSE Exam 2014 contained two parts. One part is General Ability Test and Second part is Technical Ability Test. General Ability Test consists of multiple choice questions of Reasoning i.e. General Intelligence, Quantitative Aptitude, English and General Knowledge where as Technical Ability Test consist of multiple choice questions of basics of respective engineering stream mentioned by the applicants. The marks for General Ability Test were 60 marks contained 60 multiple choice questions each of one mark. The marks for Technical Ability Test were 90 contained 90 multiple choice questions each of one mark. The Technical portion of about 90 questions shall cover basic concepts of Science and Engineering. Each right answer increase the total marks by one and each wrong answer deduces final marks by 0.33 marks. The test was conducted against total marks of 150. The written test was conducted manually on the OMR sheet which was to be filled by blue/black ball point pen. The date provided above is just expected, not official. The direct link is provided for convenience of candidates to download Answer Keys who have applied for RRB SSE Exam 2014. It is obvious that most of the candidates are opt for releasing official answer keys by the RRB. From our resources it is found that RRB is in process of releasing Answer Keys for RRB SSE Exam 2014 against Advertisement 02/2014 for the post of Senior Engineer (SSE) which will be downloaded on the official websites of RRB. The result of written examination had released on 14th March 2015 on the official website of RRB. The RRB has also released the schedule of original document verification to check originality of candidate which is going to be conducted on 29th March 2015. They are required to report at the venue on Lalpat Rai Bhawan, Sector- 15B, Madhya Marg, Chandigarh at 9.00 hrs. on the dates mentioned against Roll Numbers provided in the list released by RRB. They should bring two passport size photographs (as pasted on the Application Form) along with original documents and their copies, in two sets, attested by gazetted officer in support of their possessing specified Educational Qualification, Proof of Age and Caste certificate (in prescribed format) etc. which is mentioned below. The result of written examination had released on 16th February 2015 on the official website of RRB. The RRB has also released the schedule of original document verification to check originality of candidate which is going to be conducted on 11th March 2015. They are required to report at the office of Railway Recruitment Board, Malda at 10.30 hrs. on the dates mentioned against Roll Numbers provided in the list released by RRB. They should bring two passport size photographs (as pasted on the Application Form) along with original documents and their copies, in two sets, attested by gazetted officer in support of their possessing specified Educational Qualification, Proof of Age and Caste certificate (in prescribed format) etc. which is mentioned below. The result of written examination had released on 12th March 2015 on the official website of RRB. 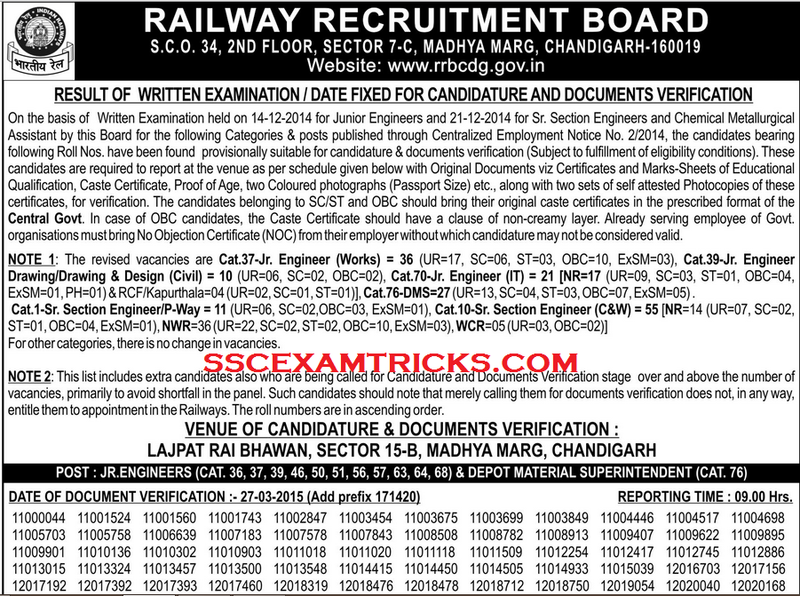 RRB has also released the schedule of original document verification to check originality of candidate. They are required to report at the office of Railway Recruitment Board, Malda at 10.30 hrs. on the dates mentioned against Roll Numbers provided in the list released by RRB. They should bring two passport size photographs (as pasted on the Application Form) along with original documents and their copies, in two sets, attested by gazetted officer in support of their possessing specified Educational Qualification, Proof of Age and Caste certificate (in prescribed format) etc. which is mentioned below. Selected candidates are required to bring computer generated online application, result print, original documents (10th, DMC, Cast certificate –If applicable etc.) and one set of self-attested of all the documents at the venue of document verificartion. 10th Certificate is used for Age Proof. Candidate must bring at least one Address proof i.e. PAN Card, Ration Card, Aadhar Card, Voter card or Driving License. Candidates are advised to bring two extra colored recent passport size photograph (same as pasted on computer generated application form) required for application form or other document requirements. Candidate must bring Caste/PWD/EXS certificate to claim for seat available for reserve category. If the candidate is an employer of any organization then it is mandatory to bring original as well as photocopy of NOC (No Objection Certificate) with them. The candidate selection is made on the basis of 30% more (extra) than the required for the selection of the post. However, they are considered for empanelment only if there is shortfall in empanelment from the main list. The medical fitness test is to check the category of eye distance visibility (eye vision) of candidates with standard required for selection of employee by Railway Administrative experts.